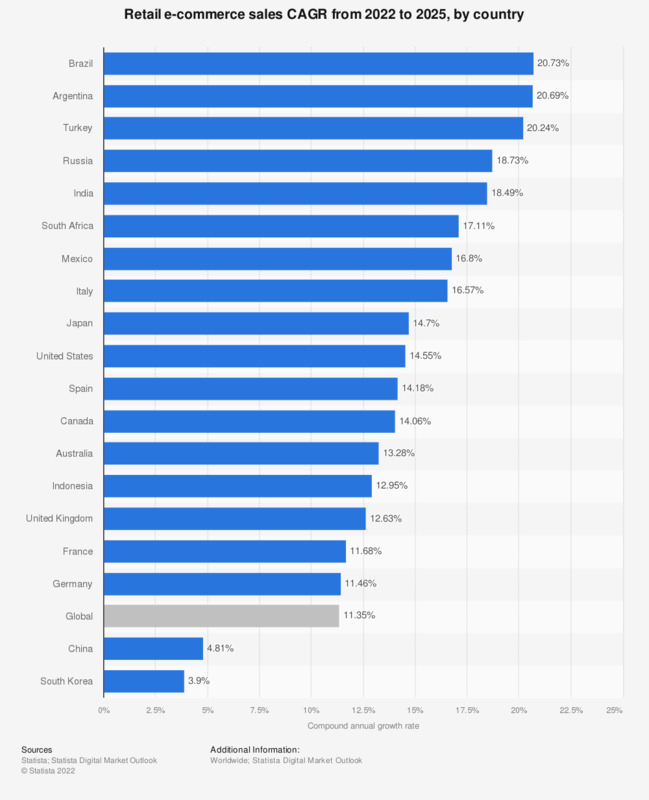 This statistic shows the retail e-commerce sales compound annual growth rate from 2018 to 2022 in leading countries. According to Statista calculations, India will rank first in terms of B2C e-commerce development with a compound annual growth rate of 19.9 in the projected period. Indonesia is ranked second with an e-commerce CAGR of 17.7 percent, followed by South Africa and Mexico. Online shopping is one of the most popular internet activities worldwide - with some product categories being more popular than others. The eCommerce market encompasses the sale of physical goods via a digital channel to a private end user (B2C). Incorporated in this definition are purchases via desktop computer (including notebooks and laptops) as well as purchases via mobile devices such as smartphones and tablets. The following are not included in the eCommerce market: digitally distributed services (see instead: eServices), digitally distributed goods in B2B markets nor digital purchase or resale of used, defective or repaired goods (reCommerce and C2C). The eCommerce market considers the following product categories: “Clothes & shoes”, “Consumer electronics & physical media”, “Food, cosmetics & pharmaceuticals”, “Furniture & home appliances” and “Special Interest”.